On the 8th of November the Dommel Valley Group hosted its second symposium. This symposium offered a dynamic, interactive program, focusing on the role of informal learning in the business environment (also called workplace-based learning). The symposium attracted an audience of 250 learning professionals. 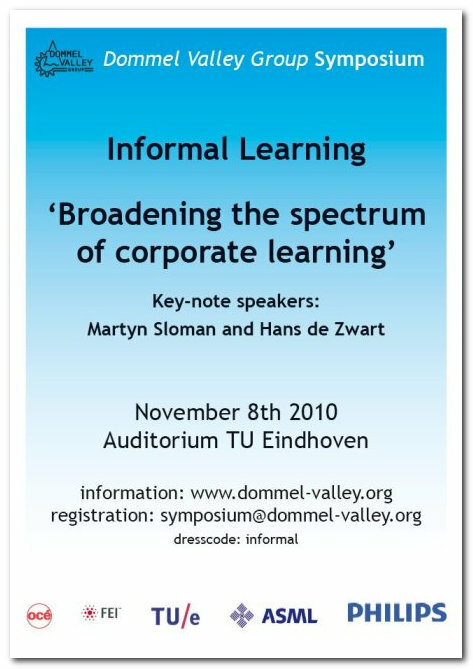 The keynote speakers, Martyn Sloman and Hans de Zwart, covered the scientific and business aspects of informal learning. Martyn Sloman is a research academic who specializes in learning, training, and development. He has extensive practical experience as a training manager. Hans de Zwart is Innovation Manager for Global Learning Technologies at Shell, with a passion for open technology and learning. In addition to excellent keynote speakers, the program brought a wide variety of activities. Participants had the opportunity to interact and network with each other during workshops and on the internal marketplace. After the symposium, a web survey was conducted among the participants, 183 of whom provided feedback. The majority of participants (82%) was very satisfied with the organization of the event. Both key notes were highly appreciated, and the feedback on the "ice breaker" performances by "De Koffer" and John van de Sande were rated as "big fun" and " putting things in perspective". In contrast, the feedback on the afternoon parallel sessions was very diverse. Interestingly, many people would have liked to have a more informal style. In addition, some participants requested a clearer definition of informal learning. Some additional other points for improvement that were mentioned by the participants were: marketplace and lunch. Not all participants were enthusiastic about the ice-breaker performances. "I liked to talk to different training professionals from other companies"
"The symposium far exceeded my expectations!" "It has been an excellent and well-thought event of a highly professional quality"
"I left the day with a motivated, inspired feeling"
"Good mix between ‘useful today’ and ‘future’ learning methods in the keynotes"
We were surprised by the large number of suggestions for new topics to be addressed by the Dommel Valley Group. This is reason enough to hold new DVG meetings; the first meeting will take place in January 2011 in Venlo. The discussion about informal learning and other topics continues on the DVG LinkedIn group where the number of members is growing. And finally, we are pleased to announce that the 3rd DVG symposium will be organized in 2011. We will keep you informed on the progress!